Since setting up his own joiner's business in 1990, Stewart Anderson has built up a substantial and appreciative client base in the North of Scotland. Now based just outside Ellon, and covering mainly Grampian and the North East of Scotland, services include supply and fitting of staircases, kitchens, doors and windows, the latter in both timber and uPVC. 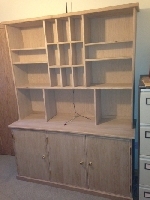 Bespoke furniture, such as TV and video cabinets, bookcases and so forth are made to suit individual requirements, made out of various types of material such as pine and hardwood or out of veneered MDF. Beautiful beds have recently been added to the range. Fitted furniture, such as wardrobes and cupboards, can be built in to your home. Unusual requests are very welcome - just contact us to discuss your requirements. Rates are reasonable and estimates are free (within a sensible radius of Ellon). Just send an email or give us a ring. Our contact details are here.